Some areas of business seem to be confusing the concepts of organisational governance and effective management to the detriment of both processes. One of the important aspects of ‘good governance’ is to create the environment that allows ‘good management’ to be practiced and to require systems that ensure ‘good management’ is practiced at all levels of the organisation’s management, but governance and management are quite different processes undertaken by different groups of people. As a basic starting point, Governance is the exclusive responsibility of the Board of Directors, or their equivalent, not management – the governing body (typically Directors) directs and governs; managers manage at various levels. Governance. The governing Board sets the organisation’s objectives, agrees the strategy to achieve the objectives, define policies and rules for the organisation, requires effective management systems, and also requires processes to be in place to ensure these are implemented by management and to provide effective oversight to the governing body. This is the exclusive non-transferable responsibility of the Board. Executive management. The executive’s role is creating the organisation capable of achieving these requirements and providing input and advice to assist the governing body’s decision making processes. Developing an effective culture of openness and accountability is a core executive responsibility. General management. Senior and operational management’s roles are to develop and maintain the systems and processes needed to make the organisation effective within the parameters set by the executive. This includes supporting middle and lower management so they can effectively manage the work needed to implement the strategy set by the Board. For some reason, these different roles are being confused in some business domains, including IT and project management to the detriment of the organisation and the respective disciplines. When a group of managers start referring to ‘normal good management’ practices as ‘governance’, they simply create excuses for bad management practice. By claiming the committee is a governance body responsible for ‘governing’ the project, usually interpreted as making sure the project does not do ‘wrong things’, the imperative for a timely decision is removed or hidden, the requirement is no wrong doing which translates into not making a wrong decision. If the project fails as a consequence of the lack of decision, it is called a ‘project failure’ not a governance failure. Change the description of the same steering committee to the management entity responsible for the overall creation of value within the organisation based on the work of the project they are overseeing, the situation changes. As the management group responsible for implementing and managing the overall Project Delivery Capability (PDC) needed by the organisation to achieve a positive ROI on its investment in the project, the same failure to make a decision can be seen to have a direct impact on the ROI the managers in the steering committee are personally responsible for achieving. This is a management failure and the managers in the steering committee are directly accountable for the delays caused to the project. 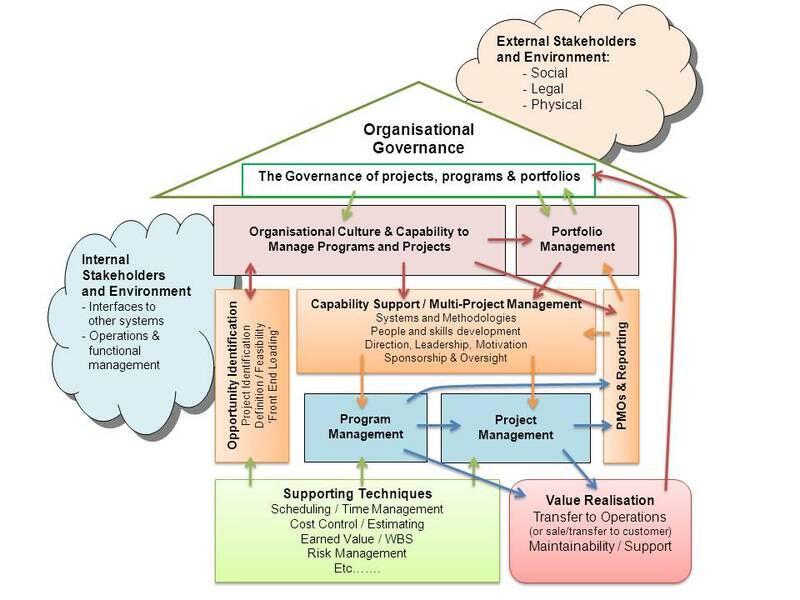 Similar issues to the project management obfuscation described above also attach to calling pragmatic and effective management of IT processes ‘governance’ – data security, backups and recovery capabilities, other IT functions and managing the projects needed to enhance IT are not IT governance issues, they are IT management responsibilities. No one claims the processes used to make sure the accounts department pay the right people the right amount of money at the right time is a ‘governance’ process – it is seen to be a prudent accounting requirement. Similarly no one claims the processes used by the stock department to fill orders with the right goods, and ship them to the right customers is ‘governance’; it is simply a customer service process. IT and project management should be no different! One short term solution that can be used to kick-start the cultural and organisational changes needed to move to an effective PDC is already in the hands of the governing body and executive. If the organisation cannot find a committed senior manager prepared to take personal responsibility for delivering the value promised by a project do not start the work! We know the lack of effective sponsorship is closely aligned to project failure, so it will be far cheaper and preserve shareholder value if projects without effective sponsors are not started. Conversely, if senior managers are responsible for the delivery of value from the projects they are sponsoring, the key people needed to create effective change in an organisation are already involved and have a vested interest in succeeding. The important thing to remember is the realisation of value from effective benefits management is very much the end of a process. The overall capability to realise value from an investment in a project starts with selecting the right project to do for the right strategic reasons, then doing the work of the project effectively and efficiently before the organisation can implement the changes and generate value. The project manager is only responsible for the bit in the middle – the ‘doing the project right’, a steering committee, sponsor or other management entity is responsible for the beginning and end parts of the overall process as well as supporting the project team. Therefore PDC has to be seen as a general management responsibility. The concept of ‘project failure’ -v- ‘management failure’ is discussed in our post ‘Project or Management Failures?’. An overview of the management framework needed to achieve effective PDC is in our White Paper: PDC Taxonomy – this White Paper is a conceptual framework not a methodology and is evolving, but should still be helpful in separating ‘governance’ from ‘management’. These ideas are not new, work by the Boston Group in the 1990s reported in our latest blog, the PDC Value Proposition shows the significant increase in ROI when an effective project delivery capability level is achieved by an organisation. The governance requirement is to ensure management accepts this responsibility and excel in creating value for the organisation. The only reason for undertaking a project or program is to create value through the realisation of benefits. Some projects generate significant intangible benefits such as reduced risk, enhanced prestige or in the case of regulatory requirements, the simple ability to keep trading; others are focused on generating a positive financial return, most generate a combination of financial and intangible returns. A key element in Project Delivery Capability (PDC) is understanding the value proposition the project or program has been created to generate. Regardless of the way the ‘return’ is measured, no project should destroy value, unfortunately as discussed in Disappearing into the Zone far too many do! 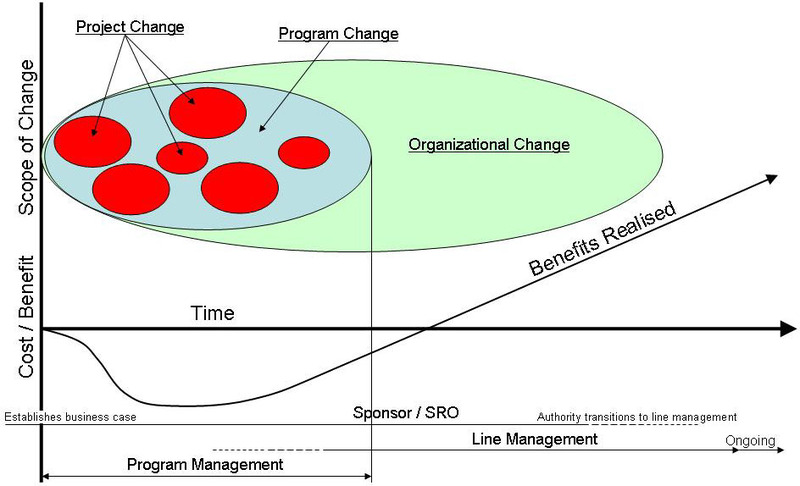 The value proposition for developing an effective PDC (itself a business change program) is compelling. World-wide research undertaken by Jed Simms at the Boston Consulting Group in the 1990s defined five levels of PDC, and found that the return on investment (ROI) from projects increased substantially at each level*. These findings have been developed into a project delivery capability model by TOP – Totally Optimized Projects Pty Ltd.
Level 1 capability is represented by executive complacency, project teams doing their own thing, no benefits management, and on average projects typically show a small negative ROI but results are wildly variable with some successes (which are always highlighted). Level 2 capability sees the imposition of process focused on measuring activity rather than outcomes. The business imposes forms, requirements and check lists; ‘methodology police’ enforce a one-size-fits-all policy. The process of developing ‘approvable’ businesses cases and standardised project reporting creates more uniform outcomes but there’s little understanding of risk -v- reward and virtually no follow through to implementation and benefits realisation. As a consequence there is typically a neutral ROI – the value created eventually covers the costs despite the glowing promises in the business case. Level 3 capability sees the organisation gaining sufficient experience and confidence to allow measured flexibility into its processes for managing projects. The basic disciplines are retained, but the way they are implemented is adjusted to suit the needs of the project. The executive view moves from imposing ‘controls’ towards an outcome focus using elements of portfolio management. However, project success still tends to be measured in terms of time, cost and scope at the end of the project rather than the benefits gained by the organisation; an output focus rather than an outcome focus. Organisations at this level generate a reasonable ROI measured at the project level but largely miss the potential for substantially enhanced business outcomes. Level 4 capability introduces a paradigm shift in executive thinking. Rather than focusing on project outputs, the work of the project is seen as a key enabler of valuable business outcomes. This requires an integrated flow from the identification of a need or opportunity within the business through to implementing the changes required to deliver of the expected business outcomes to meet the need or exploit the opportunity. Ownership of this value chain is vested in the business, the role of projects and project management is to support this overall effort by delivering the outputs best suited to achieving the business objective. The model defined in PDC = Project Delivery Capability represents the PDC framework needed to support this level. Simms’ research suggests there is an increase in ROI to 2 to 3 times that achieved at Level 3 once the focus of organisation’s executives shift to achieving business related outcomes, measuring the benefits actually realised and the value achieved. Level 5 capability expands on Level 4 with the whole PDC system focused on efficiently supporting the strategic objectives of the business. Effective strategic alignment linked to pragmatic risk management and simple but effective processes generates another significant increase in ROI! Based on observation rather then measurement, it seems the majority of organisations in both the public and private sectors are currently operating at Level 2, typically with the PMO fulfilling the role of ‘methodology policeman’, a few more mature organisations, mainly private sector, are achieving Level 3 maturity whilst others remain at Level 1. Very few have taken the step to Level 4 where the executive hold their business managers accountable for achieving the outcomes defined in the business case and invest in the PDC capability required to properly support their business managers. Doing projects ‘right’ is a Level 2 phenomena, doing the ‘right projects, right’ is Level 3; the optimum is Levels 4 and 5 where the right projects are done for the right strategic reasons. PDC was forecast by Simms as the next competitive battleground in 2005 – I would suggest it is the competitive battleground in 2012! * Source, Project Delivery Capability – the next competitive battleground, Jed Simms, TOP – Totally Optimized Projects Pty Ltd.
March 2012 marks the final edition of PM World Today – This valuable publication distributed as a free eJournal to thousands of project managers world-wide filled a valuable space between the heavy academic journals and the more newsy magazines. Over the last 14 years, viewpoints, articles and more serious papers have been published from a wide range of practitioners and academic researchers providing a valuable cross-link between the two groups. Hopefully a replacement publication will emerge. The closure of PM World Today and the PMForum website brings to a close the work of one of project management’s leading advocates, the late David Curling. PMForum was the world’s first and oldest website devoted to professional project management, created by David in 1994, PM World Today grew out of this as a quarterly newsletter, first published in 1998 and both were David’s passion through to his passing. Editorial control passed to another PM luminary, Hugh Woodward some 7 years ago, and for the last few years to David Pells. The final editorial of the now monthly eJournal, outlining many of the successes of PM World Today and PMForum can be downloaded from http://www.mosaicprojects.com.au/PDF/PMWT_Final.pdf. My hope is the rich legacy of materials contributed to the journal and the PM Forum web site may be re-published in the not too far distant future. – Project Manager: http://projectmanager.com.au – an independent Australian publication. – Project Accelerator News: http://www.projectaccelerator.co.uk/ – UK based publication supported by Parallel Project Training.